Hamster Club :: SALE ON HAMSTER CLUB GUIDE BOOK! Price only €4.99 (approx £4.30 / $6.56). SALE ON HAMSTER CLUB GUIDE BOOK! Price only €4.99 (approx £4.30 / $6.56). After 1.5 years, Hamster Club Malta grew extensively and recently launched its new hamster book named ‘Hamster Club Guide Book’. This hamster book is aimed to all hamster owners who seek hamster advice. ‘Hamster Club Guide Book’ is the ultimate best hamster book for all hamster owners, since it provides lots of expert hamster advice. This hamster book will help you with most aspects of hamster housing, feeding a hamster, hamster behaviour, hamster reproduction, hamster health and hamster important tips! It is also full of beautiful coloured hamster photos and also provides lots of natural remedies to use when a rodent vet is not available. Click here to view the first ten pages, front and back covers of ‘Hamster Club Guide Book’! HOW TO ORDER YOUR COPY! ‘Hamster Club Guide Book’ may be purchased online from TheHamsterBook.com at the price of only €4.99 (approx £4.30 / $6.56). It may also be purchased from most pet stores and major book stores. We are based in Malta and post internationally. Click here for more details. 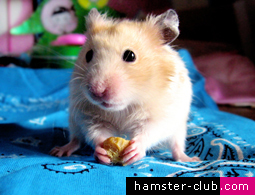 Click here to view the 'Hamster Club Guide Book' newsletter. Hamster Club Malta believes that if you have hamsters as a hobby or if you own a hamster and love these types of pets, then reading hamsters’ books will also make ones life more fulfilled with knowledge about hamsters. You can they apply this knowledge on your hamsters’ needs and provide your hamster the best life possible. Why are hamsters ideal as pets? Hamsters are ideal as pets for people who are at work or school during the day since hamsters are nocturnal, which makes them active on an evening and at night, whilst during the day hamsters will sleep. Hamsters may be ideal for all those who cannot keep large pets in their property. Hamsters are relatively easy to care for, odour from them is limited if the cage is kept clean regularly and they will provide hours of endless amusement with their busy and energetic characteristics. Hamsters come in an abundance of colours and coat lengths and there are several hamster species now available. Long coated hamsters will need regular grooming to prevent their coats matting. Keeping a hamster requires a commitment from you to care for it during its life which is approximately 2 years. This commitment includes a routine care and time spent with your hamster. Caring for your hamster will go a long way to ensuring that your pet remains happy and healthy. It’s really astonishing how such a small pet can become so tamed that it will even recognise its own name when its owner calls it! Having a hamster as a pet is worth it since it makes your life more joyful and wonderful!